I love Dino’s. Like, get excited similar to a 5yo, love Dino’s. 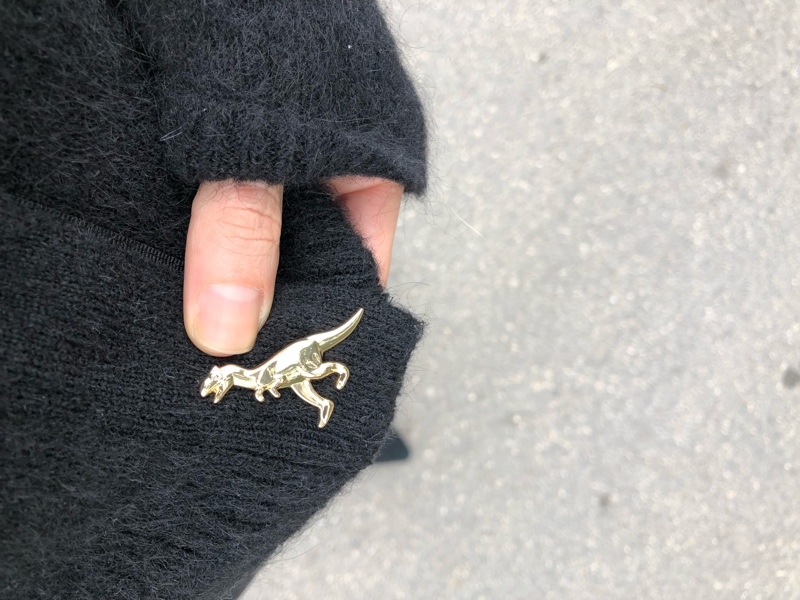 I’m always down for any sort of rewatching of any of the Jurassic Parks, and when I find Dino’s on my fashion? Heaven. Fashion is supposed to be fun. And let your loves and personality shine. So letting your Dino’s in the wild? Right up my alley. This sweater was a must have for me once I saw these buttons. (The shoulder pads and deep v are just extras, and amazing.) I knew that it would look great (keeping the rest of the outfit all black and simple, let’s my Dino’s shine. It also keeps me from veering into the “too much” category.) And because these buttons are ever-so-subtle, people can be delightedly caught off guard by them. Did I recently say I wasn’t a jeans-and-tee kind of gal? (See here). It turns out that I don’t overthink jeans and a tee when it’s part of expressing something I really love. Maybe that’s the secret to all fashion? Find something you love, or a piece that expresses something you really love, and wear it. Can it be that simple? I’d love to know: what’s something that you just love? Are you able to express it with your fashion? I’ve linked similar items below, including this EXACT sweater! Next Next post: Sunday Chronicles: Happy Spring!